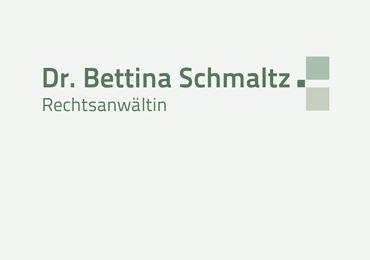 Dr. Bettina Schmaltz has been a member of the Chamber of Lawyers of Frankfurt am Main (Rechtsanwaltskammer Frankfurt) since 1998. The applicable professional rules and regulations are, inter alia, the Bundesrechtsanwaltsordnung (BRAO - Rules and Regulations for the German Bar), the Berufsordnung für Rechtsanwälte (BORA - Professional Code for Lawyers), the Fachanwaltsordnungen (FAO - Codes for Specialist Lawyers), the Rechtsanwaltsvergütungsgesetz (RVG - German Act on the Remuneration of Lawyers), and the professional code of the Council of the Bars and Law Societies of Europe (CCBE). For the applicable rules and regulations, see Federal Chamber of Lawyers (Bundesrechtsanwaltskammer) under the heading "Berufsregeln". Professional indemnity insurance has been taken out with AXA Versicherung AG, Colonia-Allee 10-20, 51067 Cologne. The information on this page as well as any questions or disputes in connection with this website are subject to the laws of the Federal Republic of Germany.